Help prevent dehydration of natural nails and the surrounding skin. Salon System's Gellux Nourishing Remover employs macadamia and sunflower oils to get to work hydrating the skin and supporting skin healing, having both natural antioxidant and anti-inflammatory properties. 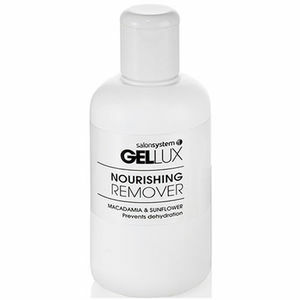 So as well as doing its removing job, this excellent product will pamper your clients' fingers and nails, too. Available in a 250-ml bottle. £5.10 (inc. VAT) Why no VAT? We're a trade wholesaler and quote our prices without VAT to help our VAT-registered customers understand the true cost of a purchase. Lint-free, highly absorbent nail wipes that won't leave fibres behind to spoil your perfect nails.